4, a pair of fixing clip and wood-screws, 3M glue paste for installation. Rich of Sun Shine Smell: 99.9% kills & cleans by high transparent Quartz Light bulb emitting rich of germicidal 253.7nm short wavelength of Ultraviolet ozone free, make the room feels like just off sun shine, bring you a brilliant day. 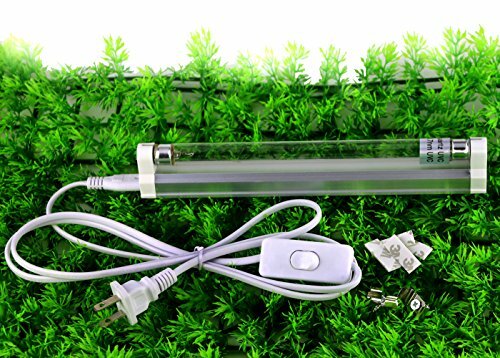 Easy Install and Using Design: 9" lamp with 5ft cord, On/off switch, US plug adapt to 100-120v AC input, Provide screw install accessories and 3M double sided pastes can both mount on metal plastic wood glass ceramic and so on. Wide Range of Using: this lamp will effectively adapt to up to 100sq.ft. room Ideal for bathroom shoebox Restaurant & kitchen pet cage Storage room chamber Wardrobe drawer refrigerator and other areas . If you have any questions about this product by Coospider, contact us by completing and submitting the form below. If you are looking for a specif part number, please include it with your message.